Situated among the Southeastern United States and bordering North Carolina and Georgia, South Carolina is the 40th biggest state in America. Home to a little over 5 million people, South Carolina is the 25th most populous state. Its capital city is Columbia, with Charleston also standing out as one of the major cities in SC. The first European settlements were founded in South Carolina in the 1500s, and the state was named in honor of King Charles I of England, with 'Carolus' being the Latin version of his name. This state is known for its unique mixture of cultures, rich historical sites, and beautiful beaches, being home to nearly 200 miles of coastline looking out over the Atlantic Ocean. With so much to do and see, South Carolina is a great state to visit on vacation or as part of an Atlantic Coast road trip, and there are lots of good campgrounds and RV parks to be found at major locations all around the state. Read on to learn all about the best RV parks in South Carolina. If you’re looking to visit one of the biggest cities in South Carolina - Charleston - then the Campground at James Island County Park is definitely one of the best options to accommodate your RV stay. There are several great RV parks in and around Charleston, but this one is extra special. It’s located down by the coast and is actually inside a 634 acre county park. 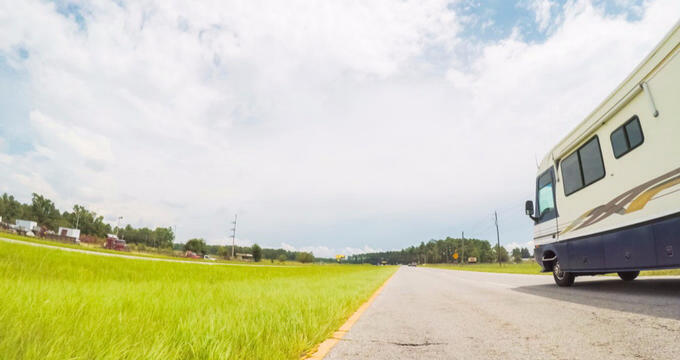 This means that the RV sites at this South Carolina RV park are surrounded by trees and natural scenery, with dozens of beautiful scenic hiking and biking trails to be enjoyed. You can head into downtown Charleston in less than 20 minutes as well, so it’s a great RV park for both rural and urban exploration. There are hundreds of RV sites to choose from at this South Carolina RV park, fitted out with all the services and utilities you could hope to find like fire pits, laundry machines, picnic tables, bathrooms, and showers. Down in the southern part of the state, not too far from the border with Georgia, Camp Lake Jasper RV Resort is super stopping point on any road trips of the Atlantic Coast. It's only a short journey away from Savannah for anyone interested in hopping over the state line to one of Georgia's biggest cities, and is perfectly located for all kinds of outdoor exploration and recreation. Very highly rated by past guests, Camp Lake Jasper RV Resort has actually won a Good Sam Club award for its excellent reviews and is widely regarded as one of the very best RV parks in the state, with a long list of on-site amenities including a cafe, high speed internet, a camp store selling all sorts of essential supplies, grocery sales, firewood sales, a huge swimming pool, clean showers, well-maintained restrooms, a fire pit, a horseshoe pit, and more. This RV park is also right by Sergeant Jasper Park, a super spot to do some kayaking, hiking, biking, fishing, and more. If you're looking to get away from it all and enjoy some pure escapism in one of the prettiest locations South Carolina has to offer, the Solitude Pointe Cabins and RV Park was made for you. Situated out in the northwestern part of the state, this RV park has enjoyed lots of excellent reviews from past guests and has proven hugely popular with people of all ages. Solitude Pointe Cabins and RV Park features both cabin rentals and spacious RV sites that can cater to small, mid-size, and large models of motor homes. Each spot offers a nice degree of shade and privacy, being surrounded by tall trees and greenery. The sites feature 20, 30 or 50-amp power and come with water and sewer services too. You'll also have the use of a charcoal grill, fire pits, and a picnic table at your RV site, as well as access to the on-site restrooms and showers, which are kept to a very high standard by the park's staff. Rates at this South Carolina RV park start at just $44 per night, and you can get the seventh night free if you stay a full week.